DR (Danmarks Radio), officially Danish Broadcasting Corporation in English, is a Danish public-service radio and television broadcasting company. 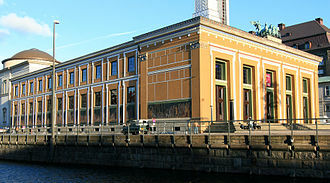 Founded in 1925 as a public-service organization, it is Denmark's oldest and largest electronic media enterprise. DR is a founding member of the European Broadcasting Union. DR is funded by a media licence which is charged to all Danish households with television sets, computers, smartphones and other devices with internet access. Today, DR operates six television channels, all of which are distributed free-to-air via a nationwide DVB-T network. DR also operates eight radio channels. All are available nationally on DAB+ radio and online, with the four original stations also available on FM radio. DR was founded on April 1, 1925 under the name of Radioordningen, which was changed to Statsradiofonien in 1926, to Danmarks Radio in 1959, and to DR in 1996. During the German occupation of Denmark in World War II, radio broadcasts were censored – under particularly harsh conditions from August 1943 – leading many Danes to turn to Danish-language broadcasts from the BBC or the illegal press, as well as Swedish radio in 1944–1945. Statsradiofonien's second FM radio station, Program 2 (P2), was added in 1951, followed by P3 in 1963. 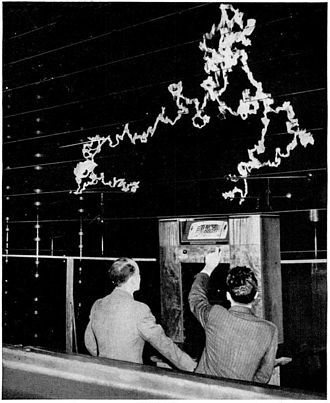 Experimental television broadcasts started in 1949, with regular programming beginning on October 2, 1951 with the launch of Denmark's first television channel. Daily programming began in 1954. Colour television test broadcasts were started in March 1967, with the first large-scale colour broadcasting occurring for the 1968 Winter Olympics in Grenoble, France. Danmarks Radio officially ended "test" transmissions of colour television on April 1, 1970, although it wasn't until 1978 that their last black-and-white television program (TV Avisen) switched to colour. On exactly 16 May 1983 at 14:00 CEST, DR launched its first teletext information service, which is still available on all DR channels. Danmarks Radio's monopoly on national television lasted until 1988, when TV 2 started broadcasting. 8 years later DR launched their second television channel, DR2 on August 30, 1996. It was sometimes called den hemmelige kanal ("the secret channel") in its early years because it could not be seen nationwide at its launch. The first trials of DAB were carried out in 1995, with eight channels officially launching in October 2002. DR K - an intercultural, documentary and "odd-film" channel. DR HD – Denmark's first free-to-air high-definition channel intended to air successful shows from the other DR channels in true HD only, with no upscaling. DR Ramasjang, a children's channel. In 2013 a new logo in which the letters "DR" featured in a white sans-serif font on a black background was introduced, and the line-up of television channels was changed once again. A new channel targeting young people, DR3 replaced DR HD. Another channel for children, DR Ultra replaced DR Update. The closure of DR Update was the start of a revamping of DR 2 as a channel for news and society. A nationwide switch from DAB to the newer DAB+ format took place on 1 October 2017. All of DR's stations plus the privately owned, public service channel - Radio24Syv, moved to the second national DAB+ multiplex (DAB-blok 2). DR's second and old logo used from 30 August 1996 to 31 May 2005. DR's third and former logo used from 1 June 2005 to 31 August 2009. DR's fifth and current logo since 1 February 2013. The principal means of funding DR is through the media licence, costing 2.492 DKK per year per household since 2017. Traditionally, radio and television owners were obliged to pay the licence, though the increased availability of online streaming led to the television licence being replaced by the media licence on January 1, 2007. The media licence is mandatory for all owners of television sets, as well as computers, smartphones or other devices with internet access. In 2007 approximately 180,000 households did not pay media licence. Revenue also comes from commercial activities such as concerts and events in the Koncerthuset, from book, CD, and DVD sales, and from overseas sales of its catalogue of programmes. Over a period of four years starting in 2019 through 2022 the media license will be replaced by general taxation, as announced on 16 March 2018 by a majority in the Danish Parliament consisting of Venstre, Conservatives, Liberal Alliance, and Danish People's Party. Eurovision Song Contest 1964, Eurovision Song Contest 2001 and Eurovision Song Contest 2014. DR P1 – "Thought-provoking radio": factual programming, reports, discussion and debate on public affairs, society and the community, plus in-depth news. DR P2 – "Music and cultural radio": classical music, opera, jazz, radio drama, and coverage of other artistic performances and events. DR P3 – Hit radio, with popular entertainment shows and hourly three-minute news bulletins. P3 also covers major sporting events. DR P4 – DR's most popular radio channel: a "modern public service station" broadcast in 10 regional versions, mixing popular music with national and local news. P4 also provides a Traffic Message Channel for delivering traffic and travel information. DR P5 – Focuses on older music from the 1950s and 1960s mixed in with some newer music. DR P6 Beat – In depth focus on underground and popular music scene. DR P7 Mix – Popular hits along with extended marathons related to particular themes. DR P8 Jazz – Jazz. DR Langbølge - The 243 kHz longwave radio is used to cover nearby seas with news and weather broadcasts. The transmissions are only 4 times daily at 05:45, 08:45, 11:45 and 17:45 local time. DR1 (24h, 16:9 720p HD), main channel with flagship evening news, sport and weather programmes. Home of DR's own high-profiled drama productions. TV series, movies and documentaries. DR2 (24h, 16:9 720p HD), breaking news, documentaries, debate, comedy and movies. DR3 (24h,16:9 720p HD), innovative programming to a target audience of viewers between 15 and 39 years old. DR K (24h, 16:9 720p HD), the channel airs films from around the world, combining its offerings with historical or cultural documentaries, as well as opera, theatre and musicals. DR Ramasjang (until 8 pm, 16:9 576i SD), for children aged 3-6 years. DR Ultra (until 9 pm, 16:9 576i SD), for children aged 7-12 years. All of Denmark is covered by digital terrestrial reception through a nationwide DVB-T and MPEG-4 network comprising six multiplexes (MUX). DR owns MUXes 1 and 2 in a joint-venture between DR and TV 2. MUXes 1 and 2 broadcast all six DR channels unencrypted. Given the low topography of the Danish mainland and islands, so-called signal overspill is inevitable if every part of the country is to receive coverage. Hence, all DRs' channels are available in northernmost Germany, and Scania the southernmost part of Sweden. Every city in Greenland can receive DR1, DR2 and DR Ultra free-to-air via a public DVB-T network. The company, Televarpið, a subsidiary of Faroese Telecom covers the Faroe Islands with a DVB-T network broadcasting DR1, DR2, DR3, DR Ramasjang and DR Ultra. DR's online presence includes a comprehensive news website and archive. It was launched as DR Online in 1996. According to Kantar Gallup, dr.dk is Denmark's most visited site. Another large part of the site allows users to watch and listen to most Television and Radio output live and for some time after broadcast using the DR TV and DR Radio platforms. DR's board of directors comprises 11 members appointed for a four-year period. Three members, including the chair, are appointed by the Minister of Culture, and six by Parliament, while the employees of DR elect two members. The board has overall responsibility for DR programs and for the hiring of DR's chief executive, the director general, and the remaining management positions. DR moved in 2006-2007 all its activities from Radiohuset in Frederiksberg and TV-Byen in Søborg to a new complex in the Ørestad area of Copenhagen. The new building, called DR Byen (the DR city), covers an area of approximately 133,000 m2 (1,431,600 sq ft). The project became more expensive than planned, forcing DR to make drastic budget cuts. In April 2007 it was announced that 300 employees would be laid off, meaning that most of the sports department would be closed down as well as most of the educational department, several programmes and the radio channel DR X. DR would also give up its rights to the Olympic Games and attempt to sell the rights to a number of other sports events including football. As the major recipient of license funds, DR operates under a public service contract with the government which it was unable to fulfil in the wake of the budget crisis related to the move. The budget overspends caused a major scandal which saw senior management of DR replaced, and was followed by a heated political debate over whether the service should receive additional emergency funding. Various measures to mitigate the impact on the public service obligations of the institution were contemplated by the Danish Parliament, and a compromise was agreed to limit the impact of the deficit. For over a decade, the Danish People's Party, a nativist and anti-immigrant political party, has criticized DR for alleged bias in its political news coverage, citing the process for appointment to DR's board of directors. In response, DR set up a "watchdog committee" intended to detect and report upon any bias. The first large-scale scientific content analysis of political news coverage on DR published by the Centre for Journalism at the University of Southern Denmark, studying election news coverage in the years 1994–2007, documented no persistent political bias towards either the left or the right. News coverage of political actors and parties was found to be largely similar to the news coverage on DR's competitor TV 2. The study concluded that political news coverage on both broadcasters was guided by journalistic professional criteria as to the newsworthiness of political actors and political issues, not by partisan considerations. In 2008, Mikael Rothstein, author and professor of religious history at the University of Copenhagen, was highly critical of DR when it issued a Christian values policy, declaring that Muslims would feel excluded. ^ "Danmarks Radios bestyrelse". Folketinget (in Danish). Retrieved 2018-06-03. ^ "DR - Danmarks Radio (LinkedIn)". LinkedIn. Archived from the original on 2011-02-11. ^ "About DR". DR. Retrieved 8 April 2017. ^ "DR". Kulturministeriet. Retrieved 8 May 2018. ^ "THE DANISH DVB-T NETWORK". Digi-TV. Retrieved 8 April 2017. ^ "Oversigt over FM-nettets sendemaster og frekvenser". DR. Retrieved 8 April 2017. ^ a b c "Denmark – Culture – Mass Media". Ministry of Foreign Affairs. Archived from the original on January 10, 2007. Retrieved 2009-04-30. ^ "DANMARKS RADIO 1925-". Danmarkshistorien.dk. Aarhus Universitet. Retrieved 8 April 2017. ^ "Censur" (in Danish). www.befrielsen1945.dk. Retrieved 2009-04-30. ^ "30 år på tekst-tv-tronen". DR. 14 May 2013. Retrieved 8 April 2017. ^ "TV2, 1988-". Danmarkshistorien. Retrieved 8 April 2017. ^ Om DR (About DR), Danmarks Radio corporate website, Undated. Retrieved January 12, 2012. ^ "DR i årene fra 2000 og frem til i dag" (in Danish). DR. Retrieved 2009-05-02. ^ "DR lancerer nyhedskanal til nettet: DR Update". DR. 21 May 2007. Retrieved 8 April 2017. ^ "Overgangen til DAB+ udsat til 1. oktober 2017". Danske Medier. 18 May 2016. Retrieved 8 April 2017. ^ "Prisen for medielicens". DR. Retrieved 8 April 2017. ^ "Skal jeg betale medielicens?". DR. Retrieved 8 April 2017. ^ "Så mange betaler ikke licens". Berlingske Business. 16 October 2007. Retrieved 9 April 2017. ^ Borre, Martin (16 March 2018). "Officielt: Regeringen afskaffer licensen og skærer 20 procent i DR". Berlingske. Retrieved 8 May 2018. ^ "Aftale om fokusering af DR og afskaffelse af medielicensen" (PDF). Regeringen. Retrieved 8 May 2018. ^ "FM og langbølge (LB)". DR. Retrieved 8 April 2017. ^ "Televarpið". Televarpið. Retrieved 9 April 2017. ^ "Etableringen af DR Online, 1994-96". Niels Brügger. Retrieved 9 April 2017. ^ "New Radio and TV House". www.dr.dk. Retrieved 2009-09-10. ^ "DR Byen – multimedia house for the Danish Broadcasting Corporation, Denmark". www.cowi.com. Archived from the original on December 5, 2008. Retrieved 2009-09-10. ^ "DR Byen, Copenhagen, Denmark". www.e-architect.co.uk. Retrieved 2009-09-10. ^ "Magnificent. Expensive. Koncerthuset –". www.cphpost.dk. January 16, 2009. Archived from the original on June 5, 2011. Retrieved September 10, 2009. ^ "DR-spareplan rammer sport og underholdning" [DR savings plan hits sports and entertainment] (in Danish). April 24, 2007. Retrieved August 31, 2011. ^ "DAB-lyttere får dansktoptoner døgnet rundt" [DAB listeners get dansktop music around the clock] (in Danish). October 23, 2007. Retrieved August 31, 2011. ^ "Economy, technology and ideology decide the future of Nordic public service companies" (PDF). www.nordicom.gu.se. Archived from the original (PDF) on June 12, 2011. Retrieved September 10, 2009. ^ "The Licence". www.dr.dk. Retrieved 2009-09-10. ^ "The act on broadcasting". www.dr.dk. Retrieved 2009-09-10. ^ "Public service contract between DR and the Danish Minister for Culture for the period from 1 January 2007– 31 December 2010" (PDF). www.dr.dk. Retrieved 2009-09-10. ^ Collins, Lauren. "Danish Postmodern Why are so many people fans of Scandinavian TV?". newyorker.com. Condé Nast. Retrieved January 29, 2016. ^ Delman, Edward. "How Not to Welcome Refugees". The Atlantic. The Atlantic Monthly Group. Retrieved February 1, 2016. ^ "Kunsten at holde balancen: Dækningen af folketingsvalgkampe i tv-nyhederne på DR1". Retrieved 2011-10-15. Wikimedia Commons has media related to Danmarks Radio. 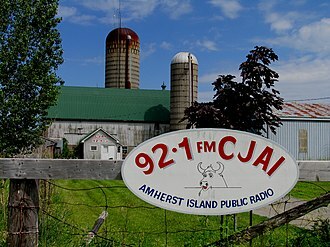 Public broadcasting includes radio and other electronic media outlets whose primary mission is public service. In much of the world, funding comes from the government, the great majority are operated as private not-for-profit corporations. Public broadcasting may be nationally or locally operated, depending on the country, in some countries, public broadcasting is run by a single organization. Other countries have multiple public broadcasting organizations operating regionally or in different languages, public broadcasting was once the dominant or only form of broadcasting in many countries. Commercial broadcasting now exists in most of countries, the number of countries with only public broadcasting declined substantially during the latter part of the 20th century. The primary mission of public broadcasting that of service, speaking to. The British model has been accepted as a universal definition. In the context of a national identity, the role of public broadcasting may be unclear. 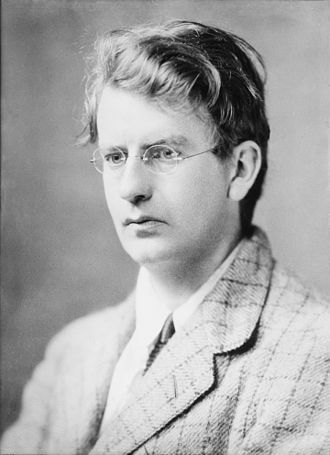 Likewise, the nature of good programming may raise the question of individual or public taste. Within public broadcasting there are two different views regarding commercial activity, one is that public broadcasting is incompatible with commercial objectives. The other is that public broadcasting can and should compete in the marketplace with commercial broadcasters and this dichotomy is highlighted by the public service aspects of traditional commercial broadcasters. 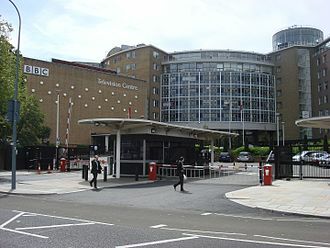 Public broadcasters in each jurisdiction may or may not be synonymous with government controlled broadcasters, in some countries like the UK public broadcasters are not sanctioned by government departments and have independent means of funding, and thus enjoy editorial independence. Public broadcasters may receive their funding from a television licence fee, individual contributions. One of the principles of broadcasting is to provide coverage of interests for which there are missing or small markets. Public broadcasting attempts to supply topics of social benefit that are not provided by commercial broadcasters. Typically, such underprovision is argued to exist when the benefits to viewers are relatively high in comparison to the benefits to advertisers from contacting viewers and this frequently is the case in undeveloped countries that normally have low benefits to advertising. In typography and lettering, a sans-serif, sans serif, gothic, or simply sans letterform is one that does not have extending features called serifs at the end of strokes. Sans-serif fonts tend to have less line width variation than serif fonts, in most print, they are often used for headings rather than for body text. 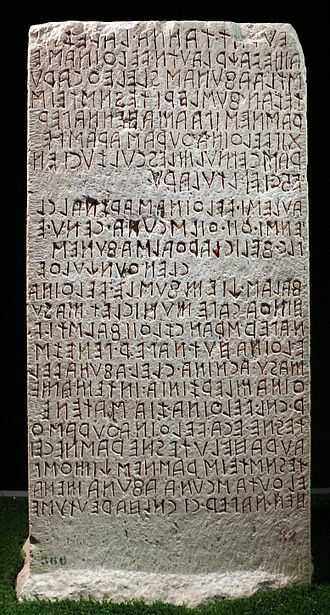 They are often used to convey simplicity and modernity or minimalism, Sans-serif fonts have become the most prevalent for display of text on computer screens. On lower-resolution digital displays, fine details like serifs may disappear or appear too large, the term comes from the French word sans, meaning without and serif of uncertain origin, possibly from the Dutch word schreef meaning line or pen-stroke. Before the term became common in English typography, a number of other terms had been used. One of these terms for sans serif was gothic, which is still used in East Asian typography and sometimes seen in font names like Century Gothic, Highway Gothic. Sans-serif fonts are sometimes, especially in older documents, used as a device for emphasis and this group features most of the early sans-serif designs. Influenced by Didone serif fonts of the period and signpainting traditions, the early sans-serif typefaces often did not feature a lower case or italics, since they were not needed for such uses. They were sometimes released by width, with a range of widths from extended to normal to condensed, with each different, meaning to modern eyes they can look quite irregular. Grotesque fonts have limited variation of stroke width, the terminals of curves are usually horizontal, and many have a spurred G and an R with a curled leg. Capitals tend to be of uniform width. Cap height and ascender height are generally the same to create a more regular effect in such as titles with many capital letters. Most avoid having a true italic in favour of a more restrained oblique or sloped design, Akzidenz Grotesk Old Face, Grotesque No.9 and Monotype Grotesque are examples of digital fonts that retain eccentricities of early sans-serif types. The term realist has applied to these designs due to their practicality and simplicity. During most of World War II, Denmark was first a protectorate, an occupied territory under Germany. On 9 April 1940, Germany invaded Denmark in Operation Weserübung, on 29 August 1943 Germany placed Denmark under direct military occupation, which lasted until the Allied victory on 5 May 1945. Contrary to the situation in countries under German occupation, most Danish institutions continued to function relatively normally until 1945. 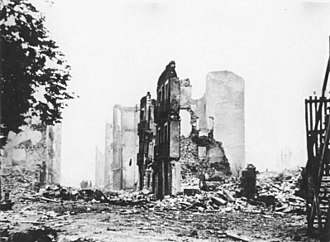 Just over 3,000 Danes died as a result of the occupation. Overall this represents a low mortality rate when compared to other occupied countries. 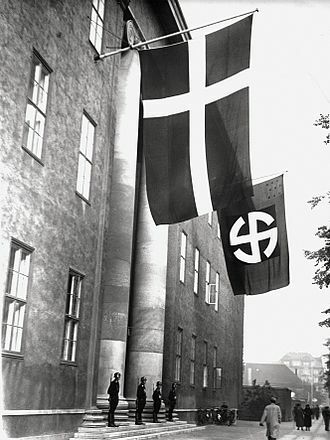 An effective resistance movement developed by the end of the war, the occupation of Denmark was initially not an important objective for the German government. The decision to occupy its northern neighbor was taken to facilitate a planned invasion of the strategically more important Norway. However, as late as February 1940 no firm decision to occupy Denmark had been made, the issue was finally settled when Adolf Hitler personally crossed out the words die Nordspitze Jütlands and replaced them with Dä, a German abbreviation for Denmark. 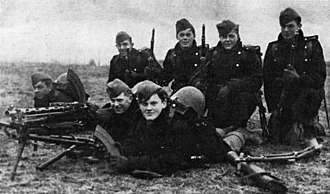 In a much more vague and longer-term way, some Nazis hoped to incorporate Denmark into a greater Nordic Union at some stage, officially Germany claimed to be protecting Denmark from a British invasion. At 4,15 on the morning of 9 April 1940, in a coordinated operation, German ships began disembarking troops at the docks in Copenhagen. 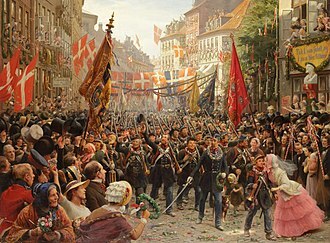 Although outnumbered and poorly equipped, soldiers in parts of the country offered resistance, most notably the Royal Guard in Copenhagen. At the same time as the crossing, German planes dropped the notorious OPROP. Leaflets over Copenhagen calling for Danes to accept the German occupation peacefully, colonel Lunding from the Danish armys intelligence office confirmed that Danish intelligence knew the attack would be coming on either 8 or 9 April and had warned the government accordingly. The Danish ambassador to Germany, Herluf Zahle, issued a warning which was ignored. 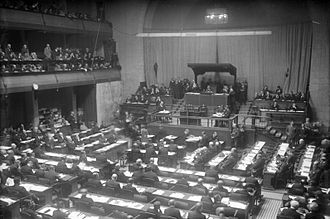 As a result of the turn of events, the Danish government did not have enough time to officially declare war on Germany. The mass media is a diversified collection of media technologies that reach a large audience via mass communication. The technologies through which communication takes place include a variety of outlets. Broadcast media transmit information electronically, via such media as film, recorded music, digital media comprises both Internet and mobile mass communication. Internet media comprise such services as email, social sites, websites. Print media transmit information via physical objects, such as books, magazines, event organizing and public speaking can be considered forms of mass media. The organizations that control these technologies, such as studios, publishing companies. In the late 20th century, mass media could be classified into eight mass media industries, the Internet, movies, radio and television. 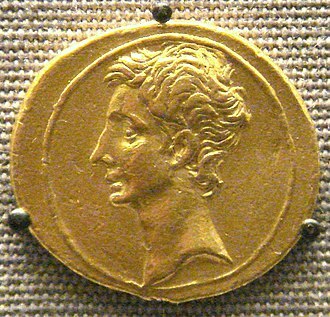 The explosion of digital technology in the late 20th and early 21st centuries made prominent the question. For example, it is whether to include cell phones, computer games. In the 2000s, a called the seven mass media became popular. The Eurovision Song Contest 2014 was the 59th edition of the annual Eurovision Song Contest. It took place in Copenhagen, following Emmelie de Forests win at the 2013 contest in Malmö and this was the third time that Denmark hosted the contest, the most recent previous occasion being in 2001. The two semi-finals took place on 6 May and 8 May 2014, and the final on 10 May 2014, the shows were presented by Lise Rønne, Nikolaj Koppel and Pilou Asbæk. The host broadcaster, DR, chose the B&W Hallerne as the host venue after considering several bids from cities and venues across Denmark, thirty-seven countries participated, this includes the return of Poland after a two-year absence and Portugal after a one-year absence. Overall, there were two countries competing compared to the previous year, making thirty-seven participants, the smallest number since 2006. Bulgaria, Croatia and Serbia announced their withdrawal from the 2014 Contest, San Marino and Montenegro both qualified for the final for the first time. The winner was Conchita Wurst with the song Rise Like a Phoenix, written by Charley Mason, Joey Patulka, Ali Zuckowski and this was Austrias first win in the competition since 1966. Jokes made about Wurst had sparked controversy, whilst Russia were booed several times during the contest, the Netherlands and Sweden finished second and third respectively with the former achieving their best result since their victory in the 1975 Contest. Armenia finished fourth, which equals their best result to date, while Hungary finished fifth, of the Big Five, only Ruth Lorenzo of Spain achieved a place in the top ten. A new record of 195 million viewers for the Eurovision Song Contest was reported, the host broadcaster, DR, and the EBU won the International TV Award at the Ondas Awards for their production of the contest. On 2 September 2013, Danish public broadcaster DR announced that it had chosen Copenhagen as the host city for the 2014 contest, the contest was held at the former shipyard Refshaleøen, in the B&W Hallerne, with the social networking hashtag #JoinUs as the motto. The Conservative Peoples Party, known as the Conservatives is a conservative political party in Denmark. The party is a member of the European Peoples Party and International Democrat Union, the party was founded 1916 based mostly on its predecessor, Højre, but on the Free Conservatives and a moderate faction of the liberal party Venstre. 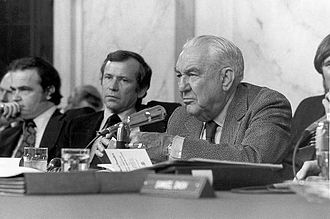 The party has participated in coalition governments, but only one Prime Minister of Denmark, Poul Schlüter, has come from this party. The student branch is Conservative Students, likewise an independent organisation, from the 2001 parliament elections until 2011, the Conservative Peoples Party was the junior partner in a coalition government led by Venstre. The Conservative Peoples Party is currently led by Søren Pape Poulsen, In the 2004 European parliament elections, the member is currently Bendt Bendtsen, who is a member of the EPP Group in the European Parliament. In the 2014 European elections, the party garnered 9. 1% of the national vote, the Conservatives remain committed to a centre-right alliance, working most closely with the liberal Venstre and somewhat less closely with the right-wing populist Danish Peoples Party. The Folketing, known as the Danish Parliament in English, is the unicameral national parliament of the Kingdom of Denmark. Established in 1849, until 1953 the Folketing was the house of a bicameral parliament, called the Rigsdag. 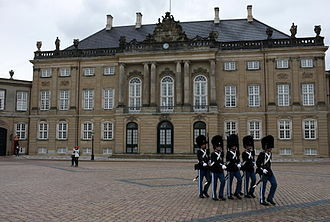 It meets in Christiansborg Palace, on the islet of Slotsholmen in central Copenhagen, the Folketing passes all laws, approves the cabinet, and supervises the work of the government. It is responsible for adopting the states budgets and approving the states accounts, as set out in the Danish Constitution, the Folketing shares power with the reigning monarch. In practice, the role is limited to signing laws passed by the legislature. The Folketing consists of 179 representatives,175 from Denmark,2 from Greenland, general elections must be held every four years, but it is within the powers of the Prime Minister to ask the monarch to call for an election before the term has elapsed. On a vote of no confidence, the Folketing may force a single Minister or the government to resign. Members are democratically elected by proportional representation,135 by the DHondt method and 40 by the Sainte-Laguë method, the Danish political system has traditionally generated coalitions. Most post-war governments have been minority coalitions ruling with the support of non-government parties, the most recent general election took place on 18 June 2015 and the Folketing reconvened on 6 October. The first sitting of the house was attended by Queen Margrethe II, from 1849 to 1953 the Folketing was one of the two houses in the bicameral parliament known as the Rigsdag, the other house was known as the Landsting. Since both houses, in principle, had power, the terms upper house and lower house were not generally used. The difference between the houses was voter representation, the Folketing was elected by common vote among men and consisted mainly of independent farmers and merchants as well as the educated classes. From 1915 both men and women had the right of vote for both houses, and the Landsting was elected by vote, although indirectly and with a higher age limit than for the Folketing. When radio waves strike an electrical conductor, the oscillating fields induce an alternating current in the conductor. The information in the waves can be extracted and transformed back into its original form, Radio systems need a transmitter to modulate some property of the energy produced to impress a signal on it, for example using amplitude modulation or angle modulation. 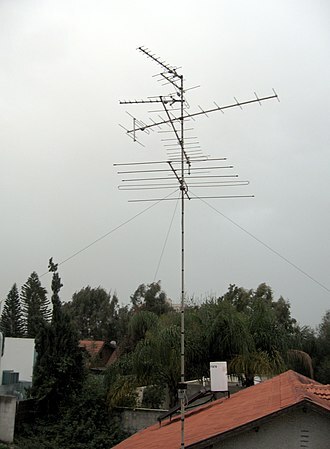 Radio systems need an antenna to convert electric currents into radio waves, an antenna can be used for both transmitting and receiving. 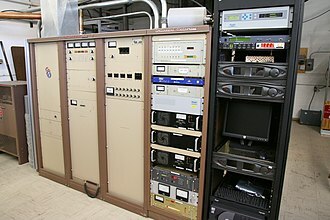 The electrical resonance of tuned circuits in radios allow individual stations to be selected, the electromagnetic wave is intercepted by a tuned receiving antenna. Radio frequencies occupy the range from a 3 kHz to 300 GHz, a radio communication system sends signals by radio. The term radio is derived from the Latin word radius, meaning spoke of a wheel, beam of light, this invention would not be widely adopted. The switch to radio in place of wireless took place slowly and unevenly in the English-speaking world, the United States Navy would play a role. Although its translation of the 1906 Berlin Convention used the terms wireless telegraph and wireless telegram, the term started to become preferred by the general public in the 1920s with the introduction of broadcasting. Radio systems used for communication have the following elements, with more than 100 years of development, each process is implemented by a wide range of methods, specialised for different communications purposes. Each system contains a transmitter, This consists of a source of electrical energy, the transmitter contains a system to modulate some property of the energy produced to impress a signal on it. This modulation might be as simple as turning the energy on and off, or altering more subtle such as amplitude, phase. Amplitude modulation of a carrier wave works by varying the strength of the signal in proportion to the information being sent. For example, changes in the strength can be used to reflect the sounds to be reproduced by a speaker. It was the used for the first audio radio transmissions. 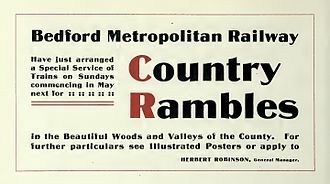 Rothbury, an early modulated sans-serif font from 1915. The strokes vary in width considerably. Christiansborg Palace, the seat of the three branches of government: the Folketing, the Prime Minister's Office and the Supreme Court. Here it is surrounded by posters, a typical scene during an election season. Day of the Tiles, 1890 painting by Alexandre Debelle, (Musée de la Révolution française). Jyske Bank Boxen, hosted the final of Dansk Melodi Grand Prix 2013. Wurst holds the Eurovision trophy after winning. Tivolis Koncertsal, Copenhagen - host venue of the 1964 contest. Parken Stadium, Copenhagen - host venue of the 2001 contest. Anders Samuelsen succeeded Naser Khader as party leader in January 2009.